Indonesia (February 9, 2012) – Scientists around the world are following the pregnancy of one of the world’s most endangered species, the Sumatran rhino. At the Sumatran Rhino Sanctuary in Indonesia’s Way Kambas National Park, “Ratu” has just completed the 11th month of her pregnancy. 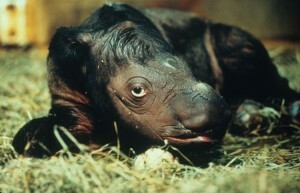 The expectant Sumatran rhino’s pregnancy will probably last four to five months longer. In February 2010, Ratu’s first pregnancy was diagnosed but she miscarried after two months. Her second pregnancy did not even last a month. A hormone supplement was prescribed when she became pregnant this third time. Ratu is one of four resident rhinos at the 250-acre Sumatran Rhino Sanctuary, which was established in the late 1990s by the International Rhino Foundation, the Rhino Foundation of Indonesia and Indonesia’s Ministry of Forestry. Two other females of breeding age, Rosa and Bina, are also maintained at the sanctuary. The young male, “Andalas”, who bred Ratu in early March 2011 is located at the sanctuary as well. Ratu is a wild Sumatran rhino who came into contact with villagers on the border of Way Kambas National Park and was rescued. Andalas is one of three Sumatran rhinos born and raised at the Cincinnati Zoo – the first of his species born in zoos in over 112 years. In 2007 he was sent to the Sumatran Rhino Sanctuary with hopes that he would eventually sire calves from one or more of the females. The same hormone supplement Ratu is prescribed was provided to Andalas’s mother when she was pregnant with him because she had also experienced early pregnancy loss. Dr. Terri Roth, director of Cincinnati Zoo’s Center for Conservation and Research of Endangered Wildlife and vice president for IRF’s Asia programs, provided the protocol and dosage that proved successful at the Cincinnati Zoo. The hormone supplement is given orally every day and will be withdrawn slowly prior to the expected delivery date. “Andalas is living proof that this hormone supplement is safe and appears to help support pregnancies in Sumatran rhinos that are having trouble carrying a pregnancy to term,” said Dr. Roth. “ Because pregnancy loss is most common in the first three months of gestation, we are now very optimistic that Ratu will carry hers to term. However, the final hurdle is the delivery, and stillbirths are not uncommon in rhinos.” Dr. Dedi Candra, based at the Sanctuary, has been monitoring Ratu’s pregnancy by weighing her weekly and conducting regular ultrasound exams. Ratu has been allowed almost constant access to her large forested enclosure where she can browse on natural plants and wallow in the mud at her leisure. The International Rhino Foundation was created in 1993 and is dedicated to the survival of the world’s rhino species through conservation and research. IRF through its on the ground partner, the Rhino Foundation of Indonesia, funds the operation of the Sumatran Rhino Sanctuary and supports Rhino Protection Units that safeguard the last remaining wild populations of Sumatran and Javan rhinos.